World acclaimed diving served by main land accommodation, including the various hotels at Suva only 49 kilometres (27 miles) away and two resorts on the island: one at Vatulele and another at Beqa island. Both of these are small, intimate and exclusive offering a great deal more besides superb diving. Pacific harbour features a world-rated 18 hole championship golf course and a cultural and shopping centre around a series of waterways and lakes. Privately owned villas border the golf course and waterways which lead to the sea and the nearby islands of Yanuca and Beqa. Both these islands are also home to the only Fijian clan which performs ritual fire walking. For the connoisseur, the areas has earned a justifiable reputation as one of the worlds top dive destinations especially around the island of Yanuca and Beqa barrier reef and various passages through the reef. Much of the profuse coral growth and fish life is due to the islands lying down wind and down current of the tonga Trench - a geologically active phenomena where volcanoes erupt frequently and send tons of nutrients to those parts of Fiji directly in the path of the west-setting current. The 3-miles wide channel is a natural conduit for the rich nutrients funnelled through by the tides feeding an intricate food chain to create a wonderland for divers. Dive boats depart daily from Pacific Harbour and from the resorts at Beqa and Vatulele Islands. The area has walls, tunnels, coral heads and undercuts ablaze with soft corals and large fish including sharks. Visibility is usually better than 20 meters. 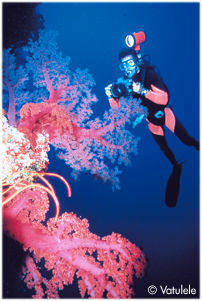 World class, Kadavus early reputation was won by the Astrolabe and solo reefs are now household names among dive connoisseurs. That was in the days when the only way to get there was by boat from Suva and the boat was a yacht named Star-Reta owned and operated by Eric Dowdall, who with David Evans, started Fijis first commercial dive operation: Scuba hire. Eric pioneered Kadavu diving and discovered the Astrolabe and solo reefs. As word slowly spread about its superb diving another live-aboard began regular visits to Kadavu and then eventually in the 1980s small resorts dedicated to divers, made their appearances. It has now been found that reefs encircling Kadavu offer outstanding diving and that its excellence is not confined to the two reefs that first made its name. In particular the Namalata and Tavuki reefs have had a good deal of exploration and are the focus of excellent diving.  Aquacadabra Diving & Adventure Sports Ltd.